The next four weeks will be busy in Washington. 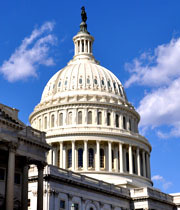 Starting this week, the House of Representatives will begin discussing appropriations for the 2014 fiscal year. This is how Congress pays the government’s bills each year. The appropriations bills follow the framework laid out in the annual budget process. You can read more about that process here. This year, I voted for the Path to Prosperity—Congressman Paul Ryan’s budget plan that reduces spending by $4.6 trillion and balances the budget in ten years. As we consider the appropriations bills this year, I’ll be very vocal about making sure we stay within the guidelines passed in the Path to Prosperity. Overall, there are 12 annual appropriations bills, the first that will come to the House floor deals with military construction and veterans’ affairs. Get the details here. After we finish the military appropriations bill, we’ll move to homeland security. You can read the details of that legislation here. In addition to appropriations, we’ll also be working to pass the National Defense Authorization Act (NDAA) to give our troops the tools they need to protect our freedom. Additionally, we will reauthorize intelligence legislation to ensure American intelligence agencies have the resources they need to combat terrorism. I’m also hopeful that we’ll take up the Farm Bill in the House this month. In May, my colleagues and I on the House Agriculture Committee passed a bill that reduces spending by nearly $40 billion over ten years. About half of the savings come from tightening eligibility standards and eliminating loopholes in the Supplemental Nutrition Assistance Program (SNAP). It also improves efficiency by repealing or consolidating more than 100 programs at the U.S. Department of Agriculture. I’m hopeful that we can pass a bill through the House of Representatives in the next month or so, and our colleagues in the Senate do the same. That will allow us to meet later this summer in a conference to work out the differences between our bills as soon as possible. I would like to see a farm bill signed into law by August so our farmers have the certainty they need to make business decisions for the upcoming planting seasons.